Back to School – Money Saving Lunchbox Ideas. How to give your kids a healthy lunch whilst still saving money. So we’re all now back to school, and many of the good intentions are already starting to fly out of the window! One of these is probably the dreaded school lunchbox. It can be really difficult to think of interesting things to put into your child’s lunchbox every day. After a few days back at school the inspiration dries up and you run out of ideas. It’s at this stage that you also remember how expensive it can be to stock up a lunchbox – especially if you are putting in extra items such as snack bars, chocolate or crisps. The dilemma is that you want your child to have a good and healthy lunch, something that they will enjoy eating but that also is not too expensive. So to help you, we’ve put together a list of some ideas to try. Items that your child will hopefully enjoy, that are quick and easy to prepare, and that don’t cost the earth. The idea is to be as creative as possible and experiment. Why not get your child involved and make the sandwiches the night before? To save money, try to use leftovers for sandwich fillings, and items in your fridge that need using up. Double decker sandwiches also tend to go down well and make a bit of a change. Many children turn their nose up at the thought of salad, but you can change this by making salads with a difference. Again, they are a great way of using up leftovers and bits and pieces that are lying around the fridge. Pasta salad usually works: either use the remains of last night’s pasta dish or mix some cooked pasta with combinations like tuna, sweetcorn and mayonnaise or ham, tomato and mayonnaise. If your child likes chicken then there is a lot you can do for their lunchbox. This can be economical if you tie it in with whatever the family is eating the night before. So if you are cooking chicken thighs or drumsticks for the family meal then do one or two extra for the lunchbox. You can then add a bit of salad dressing and either some coleslaw or perhaps tomato and cucumber. Chicken tenders or nuggets also work well. Put in a sachet or small pot of their favourite dip and they will be loving that lunch! If you like to bake then either a slice of quiche, a small pie or homemade sausage or cheese and onion roll is a great addition to the lunchbox. Vary the changes and use up whatever is in your fridge. Team the savoury item with a bit of salad and you have a winner! 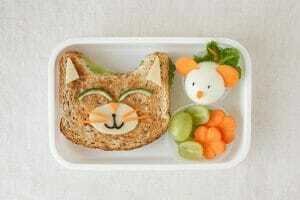 This is a great way to use up spare vegetables whilst also making your child’s lunchbox colourful and fun. Simply slice up a variety of crunchy vegetables such as cucumber, celery, peppers and carrots, and team them with a small pot of hummus. You can buy multipacks of small pots of hummus from most supermarkets or it is very easy to make your own. Mix and match to your heart’s content: remember the idea is not to go out and buy lots of things specially, but to use up what you already have and save money in the process. Adding a carton of juice to a lunchbox can bump up the cost; and in terms of sugar may not be the best choice for your child. Encourage them to drink lots of water during the day and for lunch why not provide a small flask or chill bottle of weak squash: more interesting than water but excellent for hydration. We hope that these ideas help you to prepare a healthy lunchbox for your child without spending a fortune in the process. Remember to check back here soon for more money saving ideas from Loan Pig.